Neuhausen am Rheinfall is a small municipality best known as home to Rhine Falls, a tourist attraction and Europe's largest waterfall. 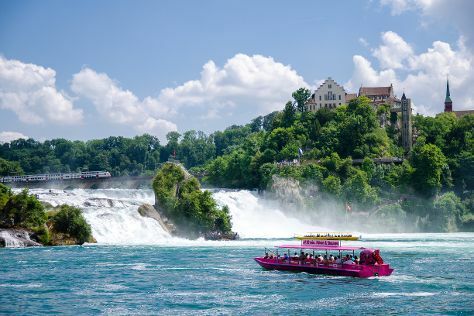 Kick off your visit on the 28th (Sun): see the interesting displays at IWC Museum, explore the historical opulence of Munot, and then admire the sheer force of Rheinfall. For other places to visit, reviews, where to stay, and other tourist information, read our Neuhausen tour planner. The Route module shows you travel options from your home to Neuhausen. In August, daytime highs in Neuhausen are 28°C, while nighttime lows are 15°C.